Cape Blanco is the westernmost point of the state of Oregon. Its lighthouse is the oldest active lighthouse on the Oregon Coast. 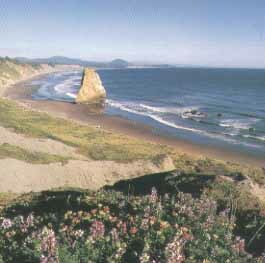 Cape Blanco is located on the Cape Blanco Hwy, 10 miles west of Highway 101, 9 miles north of Port Orford. Facilities include 53 electrical campsites, 4 cabins, a group camping area, hiker/biker camp, picnic area, restroom and shower facilities, and waste water disposal station. The park also has a horse camp plus a 3.5 mile horse trail. There is a limit of two horses in a corral. Users must keep corrals free of straw and manure accumulations. The campground is open year-round. Nearby features include the lighthouse, the 1898 The Historic Hughes House, trails and acres of open riding range.